It’s 2019 and aerial adventure parks are here to stay. If you’ve never heard of such a thing, you’ve got a lot to learn about how much you are missing out on! The long and short of it is that aerial adventure parks, or treetop adventure parks, are completely unique outdoor amusement parks that let guests challenge themselves by overcoming a range of physical obstacles and zip lines — all while being suspended up in the trees, far away from the ground! With junior and adult courses that include various levels of difficulty, there is something for everyone to enjoy at TreeRunner West Bloomfield Adventure Park. If you are looking for a way to get outside while also getting outside of your comfort zone, we’ve got over 130 exciting obstacles and zip lines for you to experience! Geena Davis, the brilliant comedian that she is, once said that, “If you risk nothing, then you risk everything.” For those of our readers who are parents, this quote probably clicked for you right away, because you’ve seen both fear of the unknown and an adventurous spirit in your loved ones. While fear, generally speaking, certainly serves its purpose (it keeps us alive in many circumstances! ), becoming too timid to face the things which cause you feelings of anxiety is a dangerous precedent to set for yourself. Luckily, Mother Nature in all her wisdom has seen fit to give us an adventurous spirit to help us explore the world and surmount challenges of all kinds! At this point, you might be wondering how all this relates to a treetop adventure park in east Michigan. But isn’t it obvious? We are lucky enough to have witnessed numerous children and adults face their fear of heights, and, more generally of the unknown, at our zip line courses, obstacle courses, and other activities experienced high above the ground! Today’s post, as we are sure the title already gave away, is all about why taking risks is healthy — and needs to be encouraged! Children are excellent at playing. They don’t need much encouragement to begin imagining a world of possibilities at their grasp. Play is also much more than merely being entertaining; it’s been called the work of children for good reason, as it’s a vital mechanism of development. 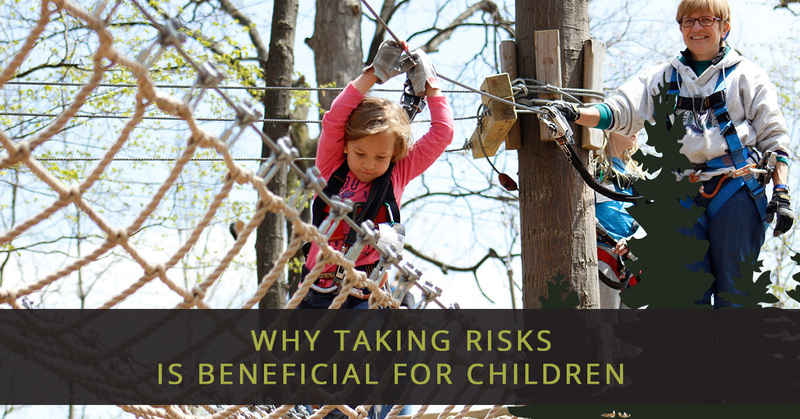 A fundamental aspect of development through play is kids tend to push their boundaries in something called risky play. This kind of play might involve playing at heights, rough-and-tumble play, play where kids become lost, play with dangerous tools, and play with high speed, among others. As an adult, those terms sound fairly alarming, don’t they? But there is great value in these kinds of play, assuming children aren’t completely left to their own devices. In fact, a study on the matter showed that children between 4 and 6 years old who were exposed to the aforementioned types of risky play (aside from playing near dangerous tools) showed that children had more advanced risk perception and competence when compared with the control group of children who had not been exposed to risky play! What does this tell us? Testing our boundaries through is not only natural, but it’s a key component of growing up to become a competent adult. So the question then becomes, how do we nurture this healthy risk-taking behavior without letting it get out of hand? That’s where we come in, with our challenging and fun activities for kids. We’ve got just the outdoor adventure kids love — complete with a controlled, safe environment to put parents at ease! Whether your little one is interested in having a zipline adventure, wants to try the obstacle course, or is young enough to enjoy our Junior Park, they will have a great time! Plus, they’ll be none the wiser that they are developing physical and psychological tools the entire time. But we’ll keep that secret between you and us! Book Your Aerial Adventure Today! Before we say goodbye for now, we’d also like to point out that our outdoor adventure park is just as fun for adults as it is for the kiddos. In the same way, grown-ups can face their fear of heights in a controlled setting. You might just have the time of your life, but we can keep that secret between us as well. Book your outdoor adventure in West Bloomfield today!